They are quick to complete. Kids can never have too many hats. I can experiment with different techniques, because what kid wants a plain hat? This Red Heart Shimmer yarn in Hot Pink covers the first two Must Haves. The loopy tassel at the top is the Something Special and Fun! Cast on 72 stitches and knit in the round for 7", then began reducing. I begin on size 8 circular needle, then switch to double-pointed needles when the stitch count gets small enough. To reduce, Knit 10, Knit Two Together all the way around. Knit a row. Knit 9, Knit Two Together all the way around, then knit a row. Continue to reduce in this manner until you have only 6 stitches left. You can place all six stitches on one needle at this point and switch to a crochet needle. Start with the first stitch on the needle. Crochet a chain about 6 inches long, then connect the end of the chain to the first (knitted) stitch with a slip stitch, Do the same for the rest of the stitches on the needle. Go around again and make loops starting with the spaces between the knitted stitches. Continue in this manner until you have as many loops as you want, then tie off and hide the tail on the inside. This hat is about 14" around. 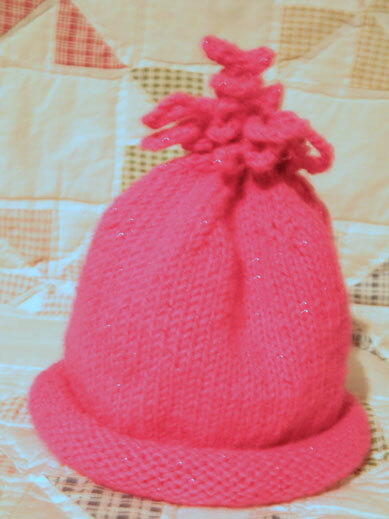 Some little sweetheart is going to look special and fun in this hat!